American businesses over the past decade have taken a most unsettling turn. According to research from the Securities Industry and Financial Markets Association, as of November 2018, non-financial corporate debt has grown to more than $9.1 trillion. What is the significance of $9.1 trillion? And what are its looming repercussions? Here, for your edification, we’ll take a moment to properly characterize this number. For one, non-financial corporate debt of $9.1 trillion is nearly half of real U.S. gross domestic product. Hence, the realization of profits by private businesses has required a substantial accumulation of debt. And this debt, like much of today’s outstanding debt, is shaping up to be reckoned with at the worst possible time. 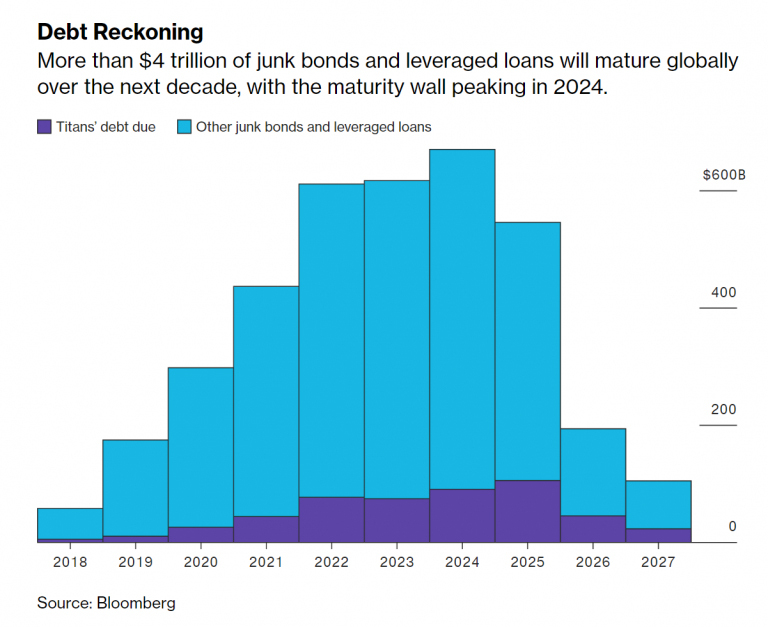 “Through 2023, as much as $4.88 trillion of this debt is scheduled to mature. And because of higher rates, many companies are increasingly having difficulty making interest payments on their debt, which is growing faster than the U.S. economy, according to the Institute of International Finance (IIF). Whereas $9.1 trillion of non-financial corporate debt is nearly half of real U.S. GDP. And whereas this $9.1 trillion of non-financial corporate debt is the junkiest corporate debt ever seen. 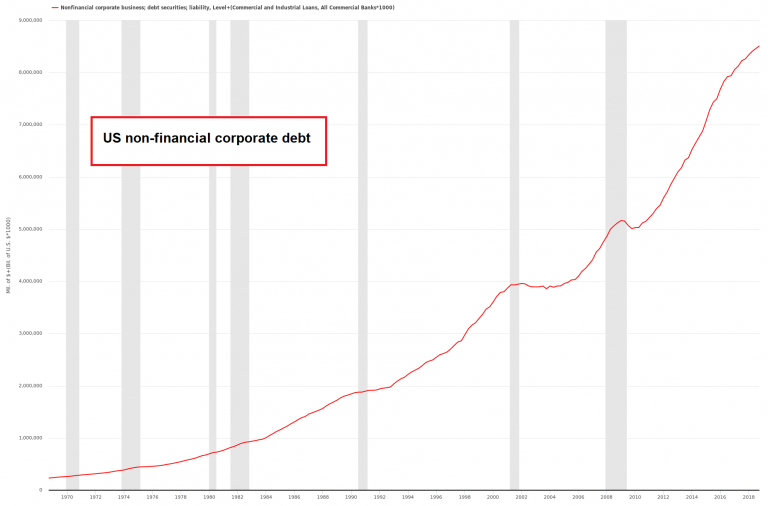 This $9.1 trillion of non-financial corporate debt is nearly double what it was just moments before the financial system exploded a decade ago. Specifically, the $9.1 trillion of non-financial corporate debt is a flashing red light and blaring siren that a grave malfunction has occurred. In 2007, on the eve of the Great Recession, total non-financial corporate debt was nearly $4.9 trillion. Today, non-financial corporate debt is 86 percent higher. The risk of an epic breakdown has never been greater. You see, today’s non-financial corporate debt is so ridiculously ugly that, upon review, it is downright diabolical. One cannot imagine how human beings, operating in an honest system, could concoct such a hideous debt edifice. And therein lies the crux of the repugnant mess. The financial system is not honest. Rather, it’s dishonest. 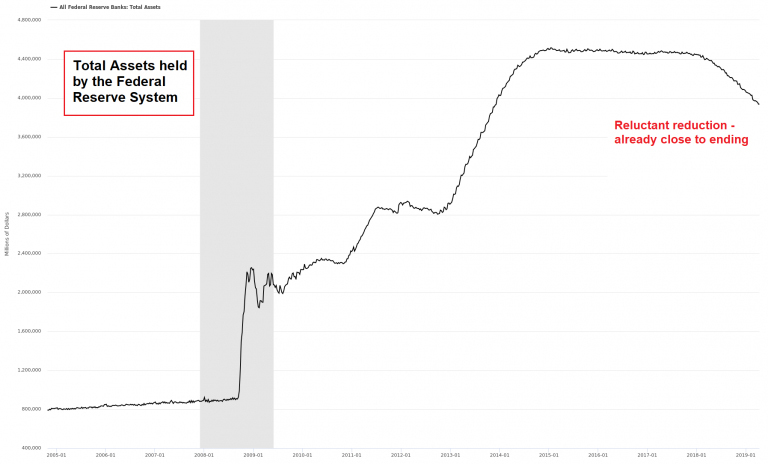 It’s based on the Fed’s fake money… and the Fed’s fake interest rates. And the Fed’s fake money and fake interest rates have influenced the economy in kind. 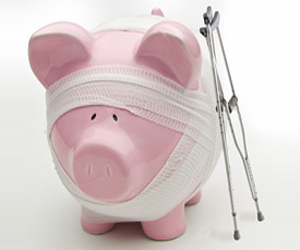 American businesses, like the federal government, have been compelled to accumulate debt. 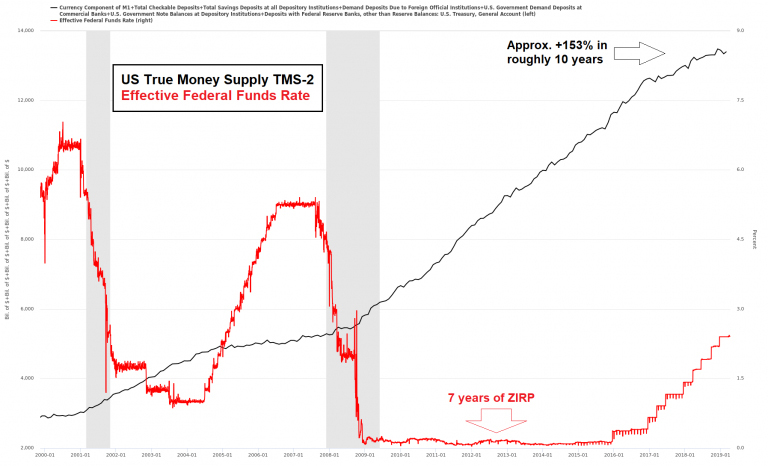 For as the evidence suggests, when a financial system rests on a dishonest foundation of debt based money, greater and greater debt levels are required just to sustain marginal growth. But as business stalls, and the debt rapidly outpaces profits, the only solution is to exacerbate the problem. That is, the solution to too much fake money and too much cheap credit is even more fake money and even cheaper credit. In short, the dishonest financial system requires compounding dishonesty to function. So where do things presently stand? Non-financial corporate debt of $9.1 trillion is the dreadful and hideous effect of compounding dishonesty. Under an honest financial system it would be so intolerably inexcusable that it would reduce the aspirations of American capitalism to a droll joke. It would be so detestable of an accomplishment it would even disgrace a compulsive riverboat gambler. But this isn’t the case at all. Non-financial corporate debt of $9.1 trillion is merely the logical consequence of a dishonest financial system – the relentless pursuit of debt for the sake of the relentless pursuit of debt. The Fed’s grand plan to normalize monetary policy – raise the federal funds rate and tighten its balance sheet to pre-2008-09 crisis levels – was an epic fail. Among other things, the corporate debt market can’t handle it. As Frank Holmes noted above, over the next four years $4.88 trillion of the $9.1 trillion of corporate debt will mature. The brutal rendezvous of compounding dishonesty and exacting reality will play out in predictable fashion. Many corporations will be unable to roll their share of this $4.88 trillion debt over at higher rates. Defaults will move significantly higher. And much of this debt will be downgraded to junk. Behind closed doors, President Trump and Fed Chair Jay Powell are in freak out mode. President Trump wants lower interest rates and artificial stimulus to fabricate GDP growth into the 2020 election year. His prospects for a second term in office depend on it. Fed Chair Powell knows the economy is toast. Annualized GDP growth for the first quarter of 2019 was recently estimated at just 1.3 percent. But he cannot yet admit it. Specifically, he cannot cut rates just yet without triggering a market panic. Quite frankly, Fed Chair Powell’s facing a no win proposition. President Trump will continue to publicly lambaste his work performance regardless of what he does. Given these prospects, Powell would be well suited to find a new job. 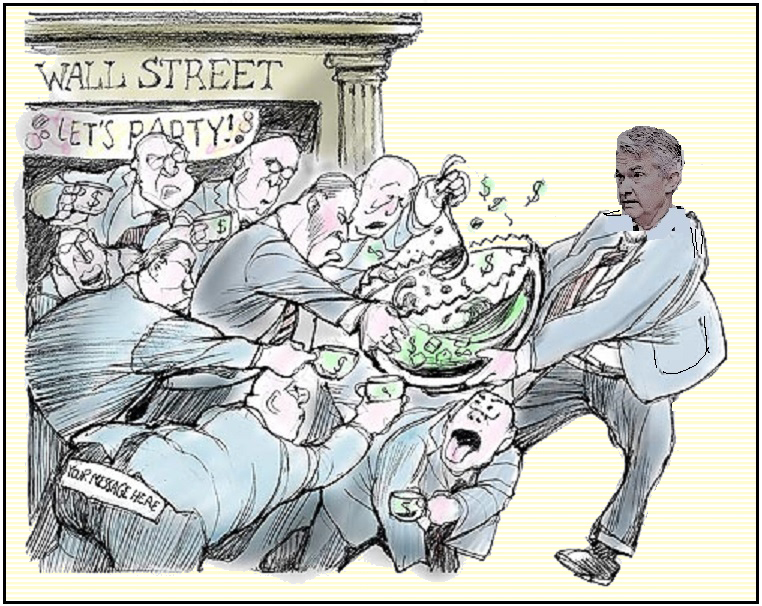 Nonetheless, Powell holds in his soft hands a mighty pen and a unique opportunity to write poetic justice. With a little mettle Powell could raise interest rates in earnest and sink President Trump’s reelection bid. In doing so, he would also put a stop to the dirty system of compounding dishonesty. 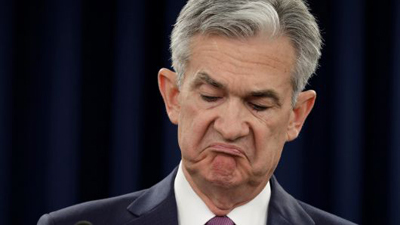 Our unsolicited advice to Powell: You’ve got nothing to lose. Go for it!